The guide will show you how to use FileZilla to connect to your slot here at Feral via FTP/SFTP. It shouldn't require any expertise to use, but it might be helpful to read the general FTP/SFTP guide first or if you encounter a more general problem. FileZilla is available on Windows, macOS and many flavours of Linux. First of all you'll need to download and install FileZilla according to its instructions. If you don't already have the software you can find a download link in the External links section at the bottom of this guide. Open up FileZilla, click File then Site Manager.... 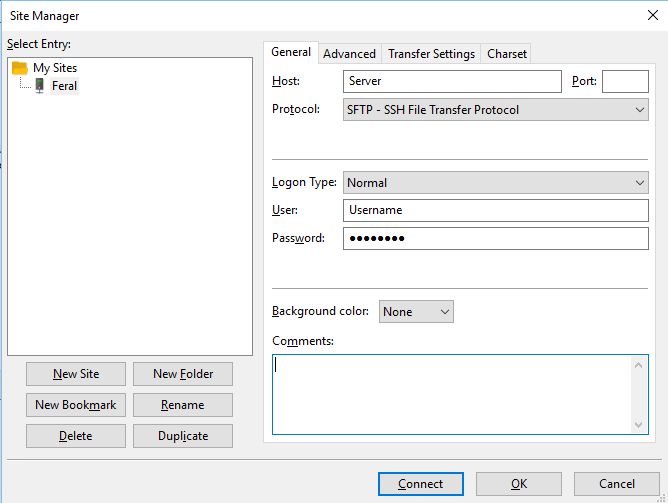 In the window which appears, make sure the Logon Type is set to Normal and Protocol set to SFTP. Then put your server/hostname, username and password which we obtained from the slot's Software page. You won't need to put in a port number, as FileZilla will automatically use the default port. But, if you want to, your two options are 22 or 22222. FileZilla doesn't support multi-segmented downloading but you should be able to download multiple files at the same time by default. You might find that each subsequent file downloads at the same speed as the first file. In other words, you may download at 1MB/s, start a second file and find that is also downloading at 1MB/s - this means you can pull (at least) 2MB/s from the server. Since Feral won't be throttling you, something is likely happening out of Feral's network. You can either download multiple files if appropriate to max out total transfer speed, or, if that's not appropriate (because you have one bigger file for example), try a program like CuteFTP Pro.